Thinking about ways to improve your diet this spring, but don’t know where to start? Maybe there are life events going on that are holding you back and making it difficult to manage your nutrition and improve your health. Or, as many of us do, you might just keep putting it off as a near-future goal. “I know I need to eat better; I’ll start tomorrow!” Sound familiar? But did you know that March is National Nutrition Month? That means that now is a great time—and a great reason—to tighten up your nutrition plan and experience the countless health benefits a better diet can provide, as many associations, dietary health professionals, and nutritionists are providing extra support this month. A nutritious diet gives you the vitamins, minerals, antioxidants, and nutrients your body needs to function efficiently and stay healthy. What you eat has a direct impact on your heart health, cholesterol, weight, and diabetes risk, as well as your risk for a number of other health conditions. So why not use this month as a way to improve your nutrition and take healthy eating more seriously? Eating a nutritious diet can seem stressful. There is conflicting information about fats, carbs, protein sources, and specific nutrients. But the truth is that it’s really not that difficult if you consider a couple of general things. First off; don’t worry too much about specific vitamins and minerals. As long as you’re eating a variety of nutritious, unprocessed (emphasis on unprocessed!) foods, you’re likely covering all your bases from a nutritional standpoint. Secondly, when it comes to the selection process during a trip to your nearby grocery store, pick up a variety of fruits, vegetables, and protein sources. Choose to eat “brown” carbs (whole grain and natural foods) and stay away from processed, refined products. As far as fats go, stick to olive and canola oils, nuts and nut butters, sources of omega-3 fatty acids, and naturally occurring fats. The key to improving nutrition is to shop the “border,” or along the outer aisles, of your grocery store. When you do this, you avoid the temptation of the sugary, pre-packaged foods filling the shelves in the center aisles. Keeping all the refined and processed options out of sight helps you cut those unnecessary foods you add to your cart. The border of the grocery store is where you’ll find fresh produce, lean protein, whole grain breads, and dairy products. Having said that, it’s OK to veer away from the border for select items, like olive oil and brown rice; just don’t wander too far! 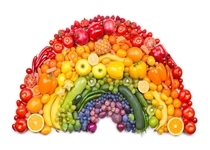 The more colorful your plate, the more nutrients it likely features. Focus on buying an array of colorful fruits and vegetables to eat throughout the day, adding them to a salad or stir-fry, or munching on them alone. You can also consider adding these colorful foods to egg, meat, rice, or other protein dishes and carbohydrate sources. Most of the time, when a food comes in a package with a list of ingredients, this means it has been processed. Even if there is a “gluten-free” label or a health stamp, it’s still best to leave it on the shelf. Health stamps can help guide you in your food choices, but know that they don’t always guarantee that an item is healthy for you, as they were once featured on boxes of “Froot Loops.” When you avoid packages and stick to fresh food, you get all the fiber and nutrition your body needs without the added salts, sugars, and ingredients not even a well-versed English major could pronounce. One of the biggest challenges to eating healthy is variety. Although there are countless options, people tend to stick to what they know in the grocery store. If you’re eating the same thing all the time, however, you’re always getting the same nutrients. Eat a wide variety of healthy, fresh foods to get sufficient servings of every beneficial nutrient you can! McVean, M, “Are Fruit Loops Healthy?” Chicago Tribune web site, October 12, 2009; http://www.chicagotribune.com/sns-health-sugary-cereals-healthy-story.html#page=1, last accessed March 23, 2015.